I don’t really know too many of my neighbors. In that regard, I’m probably like many of you. There are a few neighbors with whom I converse, but mostly I have smile-and-nod relationships with the people in the houses around me. Last Sunday — Fathers’ Day, it was — I was sitting in the front yard with son Jack — Spawn No. 4, Son No. 2 — and we were spending a magnificent afternoon discussing the German philosophers, the state of modern cinema and Lego — our usual topics. The girl from across the street tiptoed up my driveway. I saw her and waved and smiled, but she just continued tip-toeing, never breaking eye contact with me the whole time. This girl is in second or third grade, I would estimate, and her younger sister I would guess is in kindergarten. Their parents are nice in a nod-and-smile way, and her father is the only person in the neighborhood, other than me, to do yard work. I am his Brother of the Bramble. Everyone else hires landscape companies. That other dad and I nod and smile on those Saturdays when we’re out with our mowers, while our neighbors take off for an afternoon on the water. So anyway, this little girl comes up the driveway, puts something on my stone wall, then backs away. I wave, but don’t immediately get up. When I do get up, a half-hour and one beer later, I go to see what she has left me. 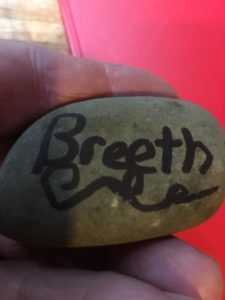 It’s a stone, on which she has written ‘breeth’ and ‘kind.’ She wrote something else that I can’t quite decipher. I thought it was sweet, and put the rock on my kitchen sill. For the last week, it’s given me pleasure to look at it. 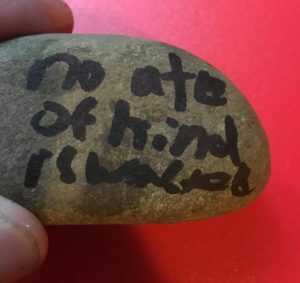 Today, when I checked the mail, there was another stone, propped up against the mailpost. 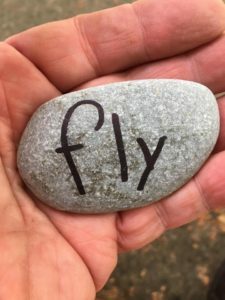 It had ‘love’ printed on one side and ‘fly’ on the other. I thought about when John Lennon met Yoko Ono. He went to a gallery opening to see her work. He saw a ladder in one part of the gallery. There was a note tacked to the ceiling but it could only be read by climbing the ladder. So he climbed, fearing the note would be some joke or something negative. 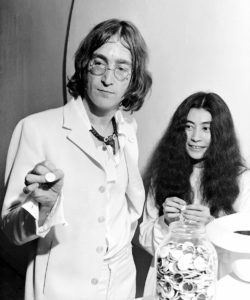 Instead, the note said, ‘Yes.’ That message of positivity helped him fall in love with Yoko. 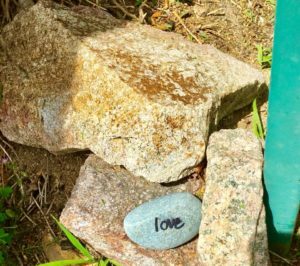 So maybe my little neighbor just wants to share a something positive with me. She knows I have teen-age boys around every weekend and occasionally she sees my adorable grandchildren. But maybe she sees me alone a lot — she’s often waiting at the bus stop when I leave for work and I give her a wave — and she just wants to do something to make my life better. She’s kind of like Boo Radley in reverse. I think her parents should be proud to be raising a child concerned about other people and what they might be feeling. When I see her parents out front next time, I think I’ll do a little more than nod and smile.